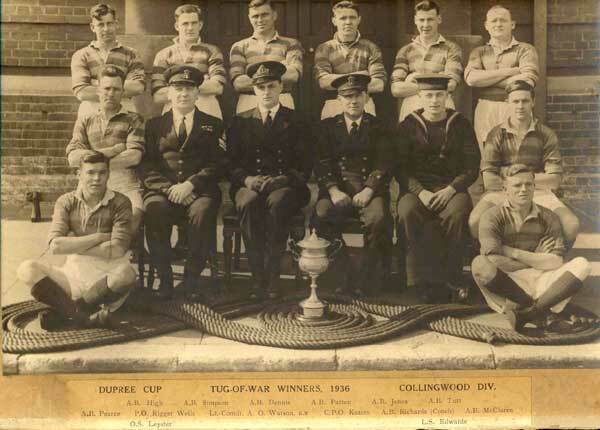 I thought you may be interested in the above, it's a picture of the winning tug of war team of the Dupree Cup my father Able Seaman William ( Bill ) Patten service number J111506 is fourth from the left on the back row. The semi final and final took place at HMS Victory Portsmouth on the 19th of March 1936 ( 1 Month before he joined HMS Repulse ). My father has written on the back of the photograph " Semi final won by 2 pulls to 1, second pull lasted all of 49 seconds, the final pull lasted 2 minutes 35 seconds ". All the names of the participating sailors are along the bottom of the photo, perhaps some of the people who visit your web page might recognise a family member. Thank you. I was well aware of HMS Victory in Pompey, having been appointed to HMS Vernon, Excellent, and Dryad over various times in my 20 years in the RAN. I look forward to your Father's details in due course, thank you for writing. As promised My fathers Able seaman William ( Bill ) Patten service number J111506 crossing the line certificate as a boy sailor. 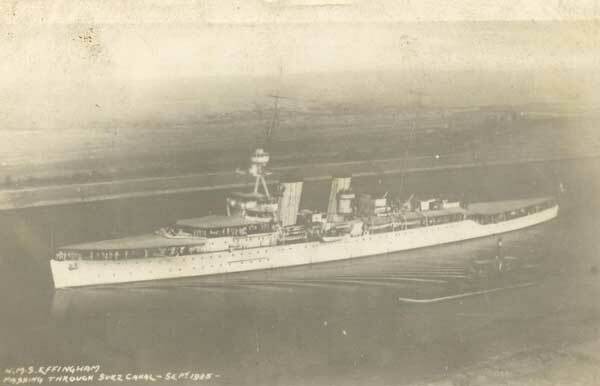 He sailed from Portsmouth on the 2nd of July 1925 on his first and the brand new heavy cruiser Effingham's first sea commission to the Indian Ocean. She was on station there for 2 years and he returned to Portsmouth on the 27th 0f October 1927 and my father was then stationed at HMS Victory for a while before joining the Destroyer HMS Amazon. A part from as my father put it" Showing the flag " the Effinghan did have a run in with Chinese pirates, they stopped their ship took every one off then blew it out of the water, that was the might of the British Navy at that time. 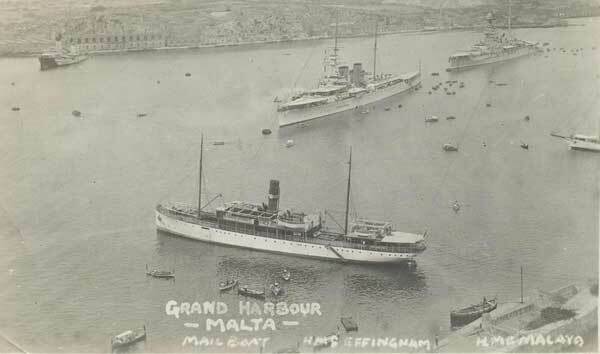 I thought you may be interested in the 3, above attachments 2 are photos of brand new heavy cruiser HMS Effingham taken in 1925 when she left Portsmouth in April of that year, at the time my father Boy Sailor 1st class, William Patten service number J111506 was aboard her on his and the ships very first sea commission to the Indian Ocean where she would be on station until her return to Portsmouth in October 1927. 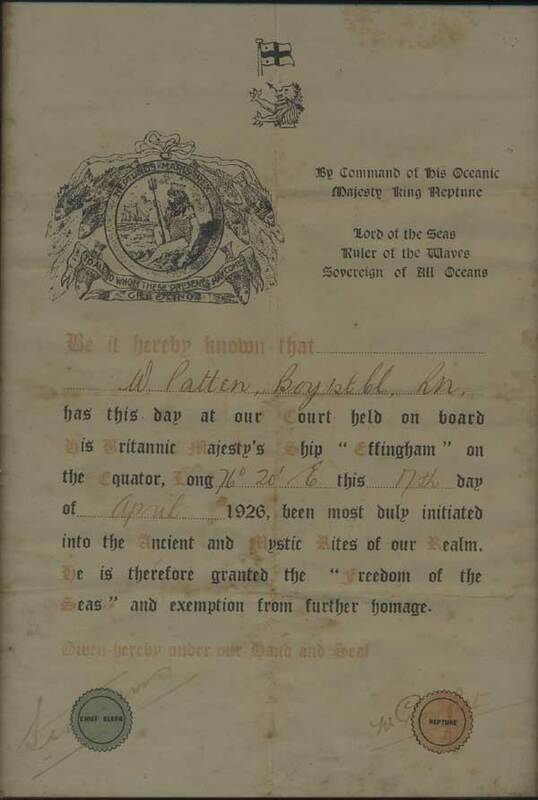 The third attachment is my fathers crossing the line certificate, at the time the ceremony Effingham was about 500 miles south of the tip of India.